When someone mentions the City of Cambridge you probably think of a particularly iconic building, its graceful face overlooking the sighing river, smiling enigmatically on the loves and ambitions of those who have ever travelled the lazy Cam in midsummer... and without even knowing exactly what ephemeral joys or permanent wonders the vision brings to mind, it's a safe bet that the one thought which doesn't occur to you is that the Chapel might not be there by Christmas. Theo (Theophilus Ambrose Fitzwilliam Wedderburn to his friends) is a Junior Research Fellow in Number Theory. Prompted by a supervisee to demonstrate how to trace the provenance of bitcoins, Theo happens across a shocking revelation, with embarrassing ramifications for the whole University. Meanwhile he is being stalked unseen by someone from his childhood. To his annoyance, Theo falls for a cheap con... and discovers a horror set not only to rock the very seat of power itself but to change the face of Cambridge and its beautifully iconic image for ever. 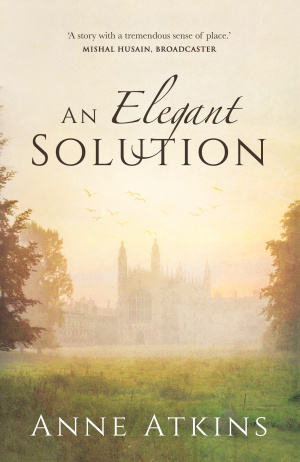 An Elegant Solution by Atkins, Anne was published by Malcolm Down in November 2018 and is our 59106th best seller. The ISBN for An Elegant Solution is 9781910786505. Be the first to review An Elegant Solution! Got a question? No problem! Just click here to ask us about An Elegant Solution.